Flux Factory makes the impossible happen every day. Help us continue to get the job done through a matching gift campaign that will double your donation. 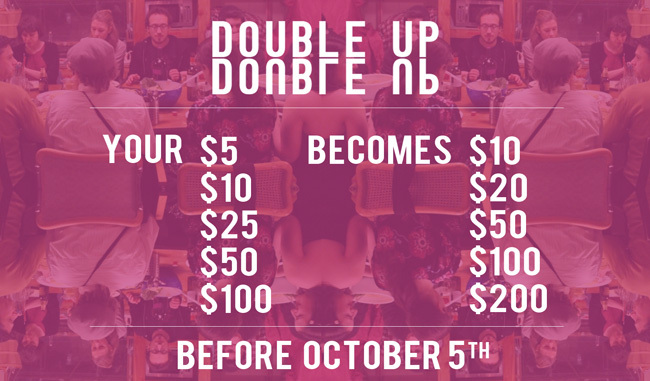 Our Trustees have generously offered to match all gifts that are contributed between today and October 5th, up to $5,000. This incredible group of individuals each has their own story about why they feel compelled to share their time and resources with this special place. There’s no place like Flux. The physical building is representative of the organization itself, with so many different pathways interwoven into a fascinating composition of community and art that is ever-changing. –Hilary Bertisch, Board Member since 2012. Its collectivity is as rare as its signature way to utilize minimal resources for maximum outcome. Flux is like this extraordinary seed you find amidst the similar. Now imagine how it would shine if we nourished it! –Doreen Jakob, Board Member since 2009. By contributing to the transformative programs that are underway at Flux Factory, you’ll help over 300 artists participate in non-traditional residencies, curated exhibitions, and events that will reach a growing audience through 2013 and into 2014. Your tax-deductible donation will ensure another year of free programming that expands beyond the conventional gallery setting, advances our artist residency program, and develops a vibrant international community of artists, organizations, and audience members who believe in the power of collaboration. Recently we paired school-aged kids with artists and urban designers to build a city just for cats; invited experts in the art, tech, and political communities to duke it out over hot button issues; founded a temporary Flux consulate overseas; and executed a reverse heist in the Museum of the Moving Image. We’re looking forward to presenting another exciting year of Flux Factory programs that expand the notion of what art can do. We’ll send you a mystery token of our appreciation in return, for donations of $25 or more. Email christina@fluxfactory.org if you have any questions. Encore By CHRIS EVANGELISTA Read the original here. The Danish press loves us because we photograph so well in gold hot pants! Take a gander at some of the press we have received so far for the projects we've debuted in the lovely town of Aarhus, Denmark.